Let’s indulge in Hiroshima food culture and cook your own Okonomiyaki. In this program, you will be introduced to the authentic Hiroshima-style Okonomiyaki, the culinary specialties of Hiroshima and the ultimate staple of Japanese cuisine. The staff from the Otafuku Sauce Co. will teach you some tips to cook the Okonomiyaki. You would be able to learn the deep relations between the Hiroshima's recovery from the post-war and the Okonomiyaki. 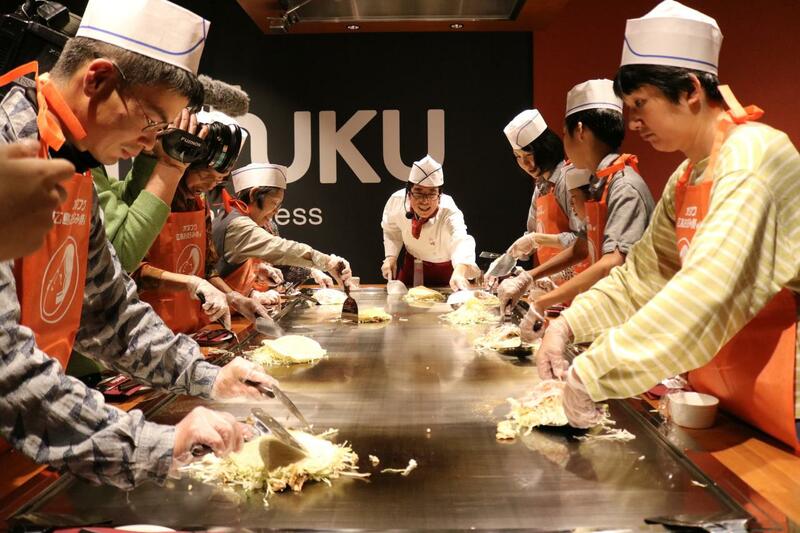 In this program, tourists would gain the deeper insight into Hiroshima’s cultural heritage, and master the technique of Japanese cuisine on a teppan (griddle). Experience the unique Hiroshima-style Okonomiyaki which the number of Okonomiyaki stores per capital in Japan is No.1. Traditional dishes sit alongside well executed set menus, with favorites including seasonal desserts, culinary oysters, and three drinks you like(including the craft beer only for this plan!) . Complementary gifts include stylized bandanas and aprons that image the Japanese samurai. Experience the essence of Japan with a gourmet food tour and immerse yourself in making your own Okonomiyaki, described as the Japanese ‘soul food’ and the culinary specialties of Hiroshima. Hiroshima is home to 1,600 Okonomiyaki shops, and is known as the prime okonomiyaki city in Japan. 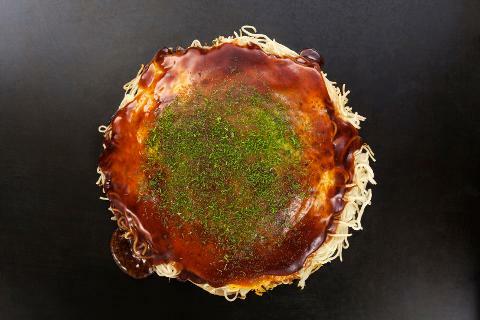 In this program, you will learn the basics of cooking the Okonomiyaki unique to Hiroshima, putting ingredients such as cabbage, tempura crisps, green onions, bean sprouts, porks, noodles and an egg in a layer on the teppan without mixing, topped with sauces and condiments. The sweetness of the cabbage perfectly matches the taste and the noodles woulld make you full just with a piece of Okonomiyaki. After cooking the Okonomiyaki, enjoy it with the sauce made by the Otafuku Sauce Co., a worldwide manufacturer of savory Japanese condiments. 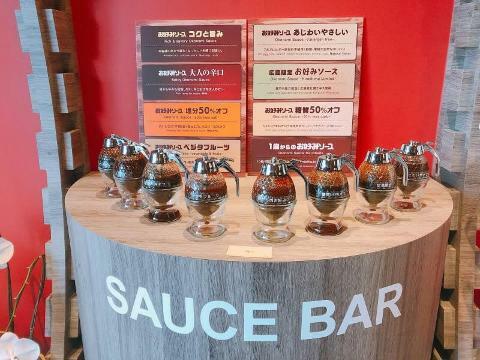 You would be able to try 8 types of sauces at the showroom. You can choose the topping of Okonomiyaki from four flavors and you can enjoy oysters, desserts, and three drinks you like(including the craft beer only for this plan!) while eating the Okonomiyaki. Veggie--Full Okonomiyaki is the best healthy food for women! In addition, it is friendly for Muslim and Vegetalian visitors. Due to event etc., the date and time of holding may differ or may not be implemented. The schedules might be cancelled because of the weather, disasters and any other reasons. Hiroshima-style Okonomiyaki was born after the atomic bomb when Hiroshima was a burnt field. It was cooked with a little bit of flour which was aided by abroad and cabbage and bean sprouts which was very cheap. Okonomiyaki was a food that was born while people were recovering from the post-war. ・Since Hiroshima was popular for the steel industry, general people were also able to easily get the griddle. 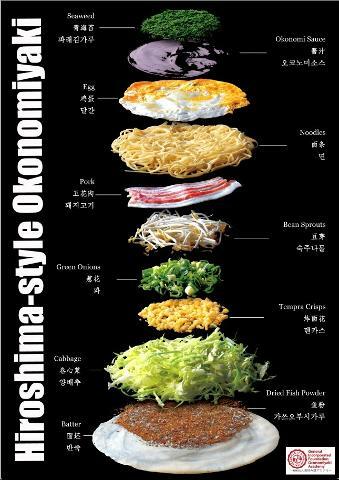 This made it easy for the Okonomiyaki to gain its popularity in HIroshima. ・Some women opened Okonomiyaki stores after they lost their husbands to the post-war, and they assisted the Hiroshima-style Okonomiyaki to become popular. Blessed with a beautiful scenery and the grandeur of its natural landscapes, take a guided tour around Hiroshima City, home to the A-Bomb Dome and Itsukushima Shrine; the two world heritage sites, and overlook the gentle waves approaching the neighboring islands in the distance.